We all love our dogs- the problem is, pests and parasites love them too for a completely different reason! While dogs are hardy creatures, there are a range of issues that can be caused by critters. These can sometimes cause some serious health problems without the right care. Here are some of the pests and parasites you may come up against as a dog owner, and how to treat or prevent them. If your dog loves walking in fields, woods or socializing with other dogs, chances are you’ve had to deal with fleas at one time or another as a pet owner. These little critters are common but should be addressed as swiftly as possible. Due to how quickly they can multiply, you can find that your house and dog are infested in very little time at all. ‘Spot on’ treatments are useful; you simply add a couple of drops to the back of your dog’s neck, and it kills fleas as well as prevents them for a month. Many contain growth regulators which will stop eggs from hatching too. Once the treatment is applied it is carried in your dog’s circulatory system, and any fleas biting them die. It’s important to read the instructions carefully when using spot on medication, used incorrectly it can be dangerous. For example, using a dog spot on treatment on cats can lead to poisoning and death. Used correctly, spot ons are an excellent way to stop fleas in their tracks without causing any damage to your pet’s health. An all in one treatment such as advantage multi for dogs will not only prevent fleas but also mites, heartworm, and other parasites too. Flea shampoos and collars are less effective. You will also need to treat your house, put your dog’s bedding and all of your soft furnishings into the hottest wash cycle. There are sprays and products you can use to kill fleas in the home, although they will have to be used while your pet is out of the room. Fleas can give your dog worms; they can also cause painful and itchy bites (especially if your dog is sensitive to them) resulting in scratching, biting and hair loss. Severe flea infestations in young puppies can cause anemia and be extremely dangerous to their health. Ticks are commonly found in grassy areas; they wait on the tips of the leaves for a host to pass where they climb on and attach to the skin using sharp mouthparts. If you find a tick on your dog, use tweezers and a steady pull to remove it. You should then thoroughly clean the bite and your hands using rubbing alcohol, iodine or lots of soap and hot water. The problem with ticks is they can spread diseases that are dangerous to both dogs and humans, one of which is Lyme Disease. This can be treated with antibiotics in the early stages but left, serious complications can occur. If you find a tick on your dog, it can be worth keeping it in a sealed container to be sent for testing if your dog goes on to develop any of the symptoms of Lyme Disease. There are a variety of different worms that can affect dogs and cause them all kinds of issues. Weight loss, a dull coat, low energy and itching and many other unpleasant symptoms aren’t nice for your dog to deal with. Thankfully treating worms is really simple, and in many cases just involves taking a tablet every three months. Heartworm is another kind of parasite and is even more of a health threat. Passed on to dogs by slugs and snails, these worms can be fatal to dogs, and it’s an emerging disease meaning it is becoming increasingly more widespread. Use a preventative heartworm medication and speak to your vet for more advice, particularly if you’re in a high-risk area. Not exactly a pest or parasite, but given the right conditions your dog can develop an overgrowth of yeast. These little fungi can often grow when your dog’s immune system isn’t at it’s best, and are also prone to becoming an issue in hot and humid environments. You’ll usually know if your dog has a yeast infection due to the smell, people often describe it as corn chips, popcorn or a musty, cheesy smell. A healthy dog won’t have a strong smell, so if yours does it’s a clue that something isn’t quite right. Many types of ear infections are caused by yeast, but it can also affect the skin too. 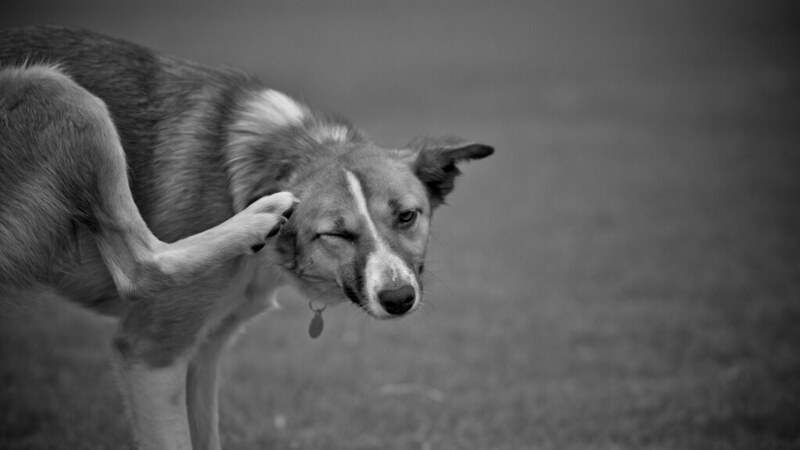 This makes your dog feel itchy and can lead to inflamed skin, biting and hair loss. Some dogs are also sensitive to wheat, which is, unfortunately, an ingredient found in many brands of dog food. Your vet may suggest putting your dog on a special diet of a grain free food. You will also need to make sure they’re not receiving table scraps, treats or raiding bins for food that could contain the ingredient. So family members and anyone visiting your home will need to be aware that they can’t give food to the dog. A special shampoo or foot wash may be prescribed to help with the skin irritation. And there are added things you can do as well. For example, a spoonful of plain probiotic yogurt a day can help to boost your dog’s ‘good bacteria’ which can prevent an overgrowth of yeast occurring. Be sure to use an unsweetened variety (sugar will simply feed the yeast and make it worse). Dogs love the taste of yogurt and will happily lick it off a spoon, or you could mix it in with their kibble. It can be worrying knowing the kinds of issues your precious dog can suffer with, but often a good preventative medication or a vet visit is enough to keep them in good health and at their best. Have you dealt with any of these issues as a dog owner?